Magical Emi is the story of a little girl who loves magic. Indeed she comes from a family of magician, her grandfather being the leader of a troupe of magic artists. One day, quite by accident, Emi sees the fairy Tobe. Now, the world of fairies, once seen a fairy must give magical powers to the human being who saw him and forever look after that person to make sure that powers are correctly used. Using her new found powers, Emi turns herself into a girls of about 17 and joins her grandfather's troupe. The story unfolds with two Emis living in tandem. For the elder Emi, there is the budding love affair with Sho, himself very talented at magic but pursuing a love for boxing. For the younger Emi, there are the various everyday incidents one would normally expect of a small girl involving her family and friends at school. Tobo the fairy is always around with his sage advise. There is also the side plot of Emi's grandfather's troupe the here grandmother's ambition modernize it. Here again both Emis play important roles. 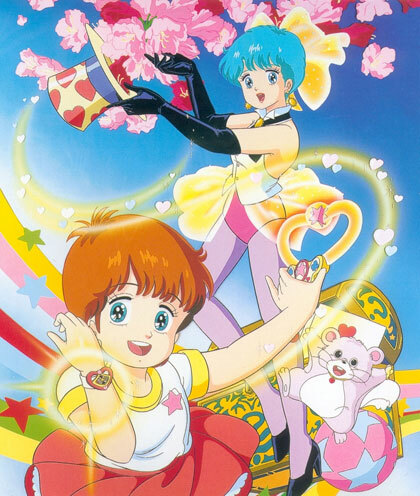 © 1985 STUDIO PIERROT. Licensed by Animation Int'l.